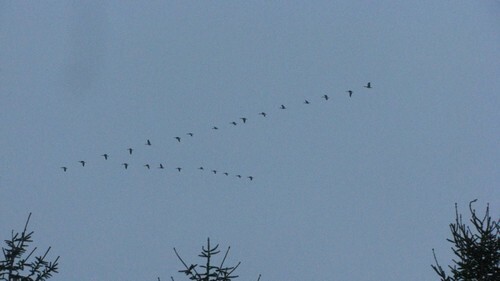 Ten thousand geese fly over my house at dusk, honking madly as I set out for a walk. And the moon (and is it Venus?) hangs over a fat white contrail in the not yet completely dark sky. I consider the heart beats, the energy above me; do they notice things like juxtapositon of moon and man made cloud? Christmas lights are on and cars pass, faces in my direction, possibly wondering why I’m standing in the street, writing on a scrap of paper in the now almost dark. Because of the geese, I want to say. And Venus, if that’s what it is. Because of the moon and… everything. I want to say look up! But the contrail has been blown away and the last of the vees has passed by. The sky has turned black leaving only the sound of the wind and tires on the road. Just the moon and maybe Venus to see— and anyone can see them anytime. No need to point. I put away my pen and carry on walking. So lovely. I love the way you look at things. Excellent title for this lovely piece. Even when we try to write in real time, it flees us. Something remains though. I guess that’s what we’re always trying to capture in words, in pictures.